I'm sharing something a little different in this post. I love creating cards, which is what I usually share on my blog. But, every once in a while I enjoy putting together a photo/stamped collage. Well, actually, I LOVE creating these! It feels like a very personal gift to give, and I put a lot of thought (and time) into creating it. I probably get as much joy out of creating the gift, as the recipient gets receiving it. Just click on any photo to see a larger version. The finished project measures 12" x 12". What a beautiful layout :) And what a lovely gift to make and give away! 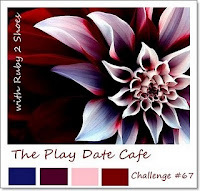 Thanks for playing at the Play Date Cafe this week! Wow this is gorgeous! A precious gift to give indeed, so so lovely! I think these colors were made for your layout! Just gorgeous!! So happy you shared this with us at The Play Date Cafe! A very subtle and elegant layout. Beautiful. So lovely to see a LO in our entries this week. You've made the colours work so well for you, such a lovely gift! Thanks for playing along with us at the Play Date Cafe this week! Gorgeous use of our colors this week for a super layout! I spy an SU lattice die cut used here and love how it looks. THanks for playing with us at the CAfe this week! I really like your layout...such a great keepsake! Oh, Susie! This is such a beautiful LO! LOVE your flourishes and all your paper punching! It all just makes those photographs, truly, shine! Thank you so much for playing along with us in the Cafe! You have nailed the colors sista! Love your beautiful LO! Thanks for playing along at The Play Date Cafe. What a sweet LO - nice to focus on the sisters. And what an adorable baby photo! Thanks for playing along at The Play Date Cafe!